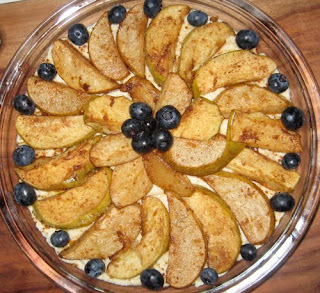 A beautifully sweet, creamy pear and apple pie that is nutritious enough to eat for breakfast. Yes, this could be your breakfast. I have been absolutely craving cinnamon lately - and it is always a good idea to listen to what your cravings may be telling you. Even when we crave absolute junk, there is often a very good reason for why we are craving that particular type of junk food. Once the body is more nourished, its cravings will become more refined, but if your body only knows it can get essential fatty acids from a big mac, or magnesium from a block of cadbury's chocolate, then your cravings will follow suit. Once you start providing your body with more satisfying and bioavailable nutrients, your cravings will evolve and become more reliable indicators of a deficiency. Anyway, back to cinnamon. Cinnamon is generally considered to be a 'warming' spice as it increases peripheral circulation. It also has a stabilising effect on blood sugar levels, so is a great addition to any sweet dessert. It is well-known for its anti-inflammatory qualities, and its constituents cinnamaldehyde and eugenol even have an antimicrobial effect, making it a culinary must for those suffering from any kind of gut dysbiosis (a great many people). This dessert is a fantastic way to get your cinnamon fix. With a bit of preparation, this nutrient-dense pie is also surprisingly easy to make and incredibly satiating and delicious. This recipe can be easily modified to be vegan if that floats your boat - even raw vegan. The nut and seed base is crunchy and slightly sweet, the vanilla cashew filling is thick and creamy, and the spiced baked pear and apple topping is sticky, sweet, and beautifully warming in this weird, changeable weather we have been having lately. The liberal use of natural fats in this recipe (have we met?) means that in spite of the fruit and natural sweeteners, this dessert provides a slow-release of energy and is therefore perfect for diabetics or those with insulin sensitivities. If you still believe that low-fat desserts are the way to go and cling to the "fat makes you fat" notion, then I urge you to read the plethora of studies emerging that show that it is in fact refined carbohydrates, not natural fats, that cause weight gain and ultimately disease. Including a bounty of natural fats from grass-fed animal sources, seafood, organic nuts, seeds, coconut, extra virgin olive oil, and avocado in your diet will pay serious dividends on your health by providing your cell membranes with strength and therefore greater immunity, supporting your heart, protecting your brain and nervous system, giving you glowing skin, improving hormonal issues (as many hormones are fat soluble), and stabilising your blood sugar - which will ultimately stabilise your moods, emotions, and sleeping patterns also. Here is the recipe - it takes a little bit of pre-thought and planning in terms of soaking the nuts, but for actual time spent in the kitchen, this pie is a cinch! Preheat your oven to 180C and gently melt butter or coconut oil in your roasting pan as the oven heats. Once melted, add in the coconut sugar or rapadura (coconut sugar if you wish for this to be a raw food dish), cinnamon, ginger and orange zest and stir together. Slice the apple and pear into pieces about half a centimetre thick and thoroughly coat in the sweet cinnamon mixture. Bake in the centre of the oven for 40 minutes, this will render them tender but with some bite remaining. NB – if you wanted this dessert to be raw vegan, simply use a combination of berries and soft stone fruit such as peaches, and marinade in the above mixture for a few hours at room temperature and then follow the rest of the steps below. In your food processor, pulse together the constituents of the crust until it is sticky and begins to hold together – this takes about 30 seconds in my kitchenaid food processor. If you blend the base for too long, the nuts and seeds will release their oils and create nut butter, which although delicious, is not what you want for this recipe. Press the crust into your pie tin, and then blend the cream filling ingredients together in your blender – I do not have a commercial blender, so first blended in my kitchenaid food processor, and then used my $30 hand blender to pulverise any lumps. 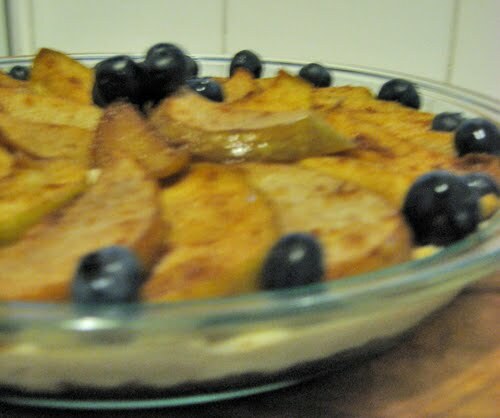 Evenly spread the creamy filling over the base, and then top with the baked or marinated fruit. I added blueberries as a final garnish, but any berry, some shredded coconut or additional citrus zest would be a great garnish too. It is absolutely divine little lady, especially with the vanilla bean.